COLORADO SPRINGS, Colo. — USA Triathlon today recognized two of the most successful coaches in its ranks for the 2017 season, naming Neal Henderson and Christine Palmquist as Coaches of the Year. 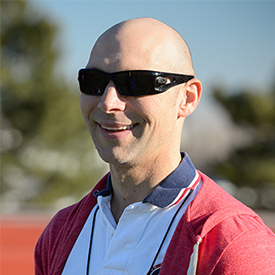 Henderson (Boulder, Colo.), who coaches USA Triathlon Junior Elite Athlete of the Year Taylor Knibb, earned the honor of National Coach of the Year. In his first season working with Knibb, Henderson coached the 19-year-old standout to her first senior-level ITU World Triathlon Series podium with a silver in Edmonton. Under Henderson’s leadership, Knibb went on to successfully defend her title at the ITU Junior World Championships in Rotterdam, the Netherlands, in September. In addition to his success with Knibb, Henderson coached Lindsey Jerdonek (Brecksville, Ohio) to a silver medal at the Yucatán ITU Triathlon World Cup, her first time cracking the World Cup podium. He led several U.S. athletes to success in professional non-drafting races, including victories for Alicia Kaye (Clermont, Fla.) at IRONMAN 70.3 Puerto Rico, Jason West (Boulder, Colo.) at the Philadelphia Escape Triathlon and Cameron Dye (Boulder, Colo.) at the Boulder Peak Triathlon. Henderson also coached several international athletes to strong results in 2017 — led by Bermuda’s Flora Duffy, who earned her second straight ITU World Championship title and fourth consecutive XTERRA World Championship title. Joe Gambles of Australia placed third for elite men at the Penticton ITU Long Distance Triathlon World Championship, and Paula Findlay of Canada took the win at the Boulder Peak Triathlon, both under Henderson’s tutelage. He has also served the sport outside of coaching itself, developing the four-dimensional power (4DP) testing methodology for cycling power that is revolutionizing the way cyclists and triathletes train on the bike. “As a coach who volunteered with the first USA Triathlon National Team in 1996 and who attended the first public USA Triathlon Level I Coaching Certification Clinic in 1998, I’m extremely thankful to be recognized by USA Triathlon for this honor,” Henderson said. Palmquist (Geneva, Ill.) was named Paratriathlon Coach of the Year for her achievements leading U.S. paratriathletes to success at the elite level. In 2017, she coached National Team athletes at the USA Paratriathlon National Championships in Pleasant Prairie, Wisconsin, and the Rotterdam ITU Paratriathlon World Championships. U.S. athletes raced to seven medals in Rotterdam, including a gold from Grace Norman (Jamestown, Ohio) in the women’s PTS5 class. Palmquist had a lead coaching role last season at training camps for the USA Paratriathlon National Team in Colorado Springs, Colorado, and the USA Paratriathlon Development Team in Chula Vista, California. In addition to her team coaching role, she individually coached Melissa Stockwell (Chicago, Ill., PTS2), who earned a silver medal in October at the Sarasota-Bradenton ITU Paratriathlon World Cup, and Patty Collins (Alexandria, Va., PTS4), who earned bronze medals at the ITU Paratriathlon World Championships and the Yokohama ITU World Paratriathlon event in addition to earning a national title in 2017. Palmquist also played a key role in coach development for the sport of paratriathlon last year, contributing to the manual and presentation materials before providing in-person instruction at the first-ever USA Paratriathlon Coaching Certification Clinic held in July in Colorado Springs. USA Triathlon named its full roster of 2017 Athletes of the Year — including Age-Group Triathletes, Age-Group Duathletes, Elites and Junior Elites — earlier this week. Click here to view the full list of honorees.